Firstly I thank you for your reaction to my email, inline with the message, which I have sent to you. How is every thing over there in your country, i believe that you are in good health, and that the atmosphere over there in your country is very nice today? Mine is a little bit cold over here in Dakar Senegal. My name is (Avivan George) i am (24 years old) but age doesn't matter in a real relationship, I am from (Ivory Coast in West Africa) 5.2ft tall, fair in complexion single, (never married) and presently i am residing here in Dakar refugee camp as a result of the civil war that was fought in my country some years ago. My late father (Dr George Edmond) was a politician and the chairman managing director of a Richard And Sons (INDUSTRIALS COMPANY LTD) in Abijan the capital of Ivory Coast, before the rebels attacked our house one early morning and killed my father and mother in cold blood. I know that i should have waited for our relationship to last a while before i tell you all this secret, but because of my situation here in the camp, and i don't want to die here, please. Right now, as i am talking to you, i am the only person alive in my family, and I managed to make my way to a near by country (Senegal) where i am leaving now as a refugee under the care of a Reverend Father Emmanuel Christian i am using his computer to send these message to you now. I don't have any relatives now whom i can go to, all my relatives ran away in the middle of the war, the only person i have now is the Rev Father (Reverend Emmanuel Christian), who is the Father of the (St John Catholic Church) here in the camp, he has been very nice to every body in the camp, but we are not living with him, rather we are leaving in the hostel, which is divided into two sections, one for the male, and the other for the female. The Father Tel number is (+221777345711) or (+221766555501). if you call and tell him that you want to speak with me (Avivan) he will send for me in the hostel. As a refugee here, i don't have any right or privilege to any thing, be it phone or what ever, because it is against the law of this country. My love I want to go back to my studies because i only attended my first year before the tragic incident that lead to my being in this situation now took place. Please listen to this (please it's a secret, even no one knows about it except the Reverend father that knows about it), I have my late father's (personal written will and death certificate) here with me, which i will send to you latter, because when he was alive he deposited some amount of money in a bank which he used my name as the next of kin, the total amount, is ($4.6 Million United state dollars). So i will like you to help me transfer this money to your account and from it, you can send some money for me to get my traveling documents and air ticket to come over to meet with you. and Your Country, including your pictures in your next mail. Meanwhile i will like you to call me like i said i have a lot to tell you, attached here is my pictures. I will send you more in my next mail. Have a nice day and think about me. waiting to hear from you soonest. I thank you ones again for reaching me. I hope you are keeping fine today, As for me, i am not looking fine over here. Really it sounds some how depositing such a big trust to some body that you have never seen in person but one thing you ought to understand is that any body who is into difficult situation may be looking for help from every angle and when i come in contact with you i was some how felt relaxed saying with you that God has answered my fasting and prayer's. I was moved. I appreciate your acceptance to assist me to my request as regards to the money and this has made me to get the bank informed in a mail about you, i introduced you to them. I see you as a very nice person whom i can lean upon for trust and support for life; I see you as very responsible, competent and mature enough to assist me to direct my life to a positive direction in life.Please i have not told any one except you about the existence of this money and i will like you to please keep it secret to other people because since it is money i feel all interest will be on it. Remember i trust you that is why i am giving you all this information!. I will like to hear your voice in due cause please, I have informed the bank about my plans to take and transfer this money and the only thing they told me is to look for a very responsible person, who will stand on my behalf as a trustee to this money due to my refugee status and the laws of this country. I have to use this chance to let you know about it, i have decided not to continue staying over here any more, i would like to use this chance get you introduced to the bank as my partner and the person who will be standing on my behalf as regards to this money. In this regards i will like you to contact the bank immediately with their contact information below; please tell them that you are my foreign partner and that you want to know the possibilities of assisting me transfer my (4.6 million USA dollars) Four million Six hundred thousand USA dollars) deposited by my late father of which i am the next of kin/beneficiary, to your account in your country. NAME OF THE TRANSFER - Chief Executive Officer (CEO) MR.ROSS MCEWAN. AMOUNT IN DEPOSIT......(4.6 MILLIONS US DOLLARS). I was well known in the Orphanage Home here with Choir Master Because i am a Leader in the Church Choir and the real name my parents called me is Miss Avivan George. Please try and contact them now to confirm this and as well on how possible to transfer the (4.6million USA dollars) deposited by my late father of which i am the next of kin to your account in your country. My dear i am glad that God has brought you to see me out from this situation and i promise to be very grateful and will equally need you in every area of my life plus investing this money since i am still too young and inexperienced to comfortably manage my life for now. I have map out 5% for every expenses you will make before this transfer and 15% for all your good effort towards my freedom. As i told you before, this Orphanage Home is just like a prison and my prayers is to move out from here as soon as possible. Please make sure that you contact the bank so that after the transfer you will send some money from my late father money for me to prepare my traveling documents to meet with you in your country. I feel i can make it to join you as soon as you are through with this transfer or you can come down to meet me over here and see how you will assist me to join you. I don't think i will regret staying with you in your country, i feel it's so better for me to be with you than to be over here, i have made my decision not to continue staying in West Africa. i hope you approach this issue as yours, and give an urgent attention, because i am not in good condition and i want to be free in all my life; i so much trust you and i will like you to maintain the trust i have got in you. Honey please keep this transaction secret this is a very huge amount of money. i will not like people to know about this fund because i am afraid to loose my life or the money. I will be waiting to hear from you soonest!. HEAD QUARTER OFFICE No: 36 St Andrew Square, Edinburgh EH2 2AD. I have been directed by the director of Foreign Operation/Wire Transfer to write you in respect to your partner's letter, which we have received. Actually, we have earlier been told about you by this young lady Miss Avivan George, that she wishes you to be her trustee/representative for the claim of her late father's deposit with our bank. Late Dr. Edmond George, is our late customer with account No. 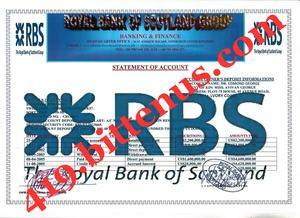 026004093 substantial amount $4,600,000.00 USD (Four Million six Hundred Thousand US Dollars) which he deposited with us. Hence you have been duly appointed as a trustee to represent the next of Kin. However before our bank will transact any business concerning the transfer of the fund with you, we will like you to send the followings. 2. 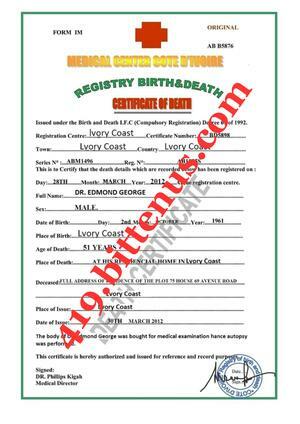 The death certificate of late Dr. Edmond George (Her deceased father) confirming the death. 3. A copy of statement of account issued to Dr. Edmond George by our bank. Note that the above are compulsory, and are needed to protect our interest, yours, and the next of kin after the claims. These shall also ensure that a smooth, quick and successful transfer of the fund is made. We promise to give our customers the best of our services. Should you have any question(s) please contact our Chief Executive Officer (CEO) Mr. ROSS McEwan. I want to thank you for all your concern and your efforts to assist me receive my late father funds into your account. I write to let you know that I myself and REV father has concluded on the arrangement of getting the reputable lawyer who is ready to carry out the assignment of procuring those two important documents requested from the bank. It is a great pleasure to write you Sir in regards to the information pass across to me by one miss Avivan whose father’s name is late Dr George Edmond and that the father died as a result of war that happens in their country Ivory Coast some years back, So before the death of the father, he deposited some amount of money in one of the leading bank in Europe called Royal Bank of Scotland with the name of Miss Avivan as the next of kin, So duo to condition of the young Lady as a refugee, She wishes me to transfer to money from the bank to my bank account in my country on behalf of her, so i have contacted the bank by myself and they told me to get in touch with a Senegalese resident lawyer who can draft a power of attorney and affidavit of oath with my names and address which will enables me to receive the money as her trustee, I do here by demand that according to advise of the bank, I will appreciate if my request is urgently granted. As you can see everything concerning this transfer is coming to a perfect end, on that note, please do not fail to get in touch with the lawyer today. I will appreciate if you act according to my instruction, please after contacting the lawyer through email, try also and call him on his direct telephone number at least that will shows a sign of seriousness from you.thank you for your concern and my love for you will never die. In compliance with the content of my email dated 09/11/2014. I wish to inform you that after due confirmations from the bank, of the true existence of the money, its legitimacy and enquiries from appropriate quarters about the needful for successful completion of the transfer process, that I hereby accept to dutifully handle the case. Prior to my conversation with the bank as i contacted the bank today. I understand from the Bank Transfer director that the actual credit balance at the moment is US$4.6 million The Transfer director also mentioned that you have already being nominated by the next of kin and they are expecting that you get back to them soonest for further transfer to your country. I have seen the documents even as your partner shows me. The young girl father's death certificate, and the deposit certificate I was meant to understand from the bank that these documents are required by them for the transfer. 1. I have drafted a tentative power of attorney/affidavit of oath based on your partner request and information which will be Notarised on my chambers letter head after the signature of party involved at the Federal High Court Here In Dakar Senegal. 2. After due consultations from Dakar Federal High Court, I understand that it will officially cost the sum of 70 DOLLARS (only) to legalize the power of attorney, but poverty alleviation levy imposed by government of Senegal on any investor in the country in the category of such fund income is 900 DOLLARS with court fee of 70 DOLLARS totaling Nine Hundred and seventy DOLLARS) which must be paid to Inland Revenue Office. The payment receipt would be tendered to the Federal High Court before the power of attorney is notarised. My chambers' legal fees is 5,000 dollars (Five Thousand DOLLARS only). The funds in Bank is a guarantee to you by the next of kin now, therefore you should pay my legal fees of 5,000 DOLLARS (including notary fee) ten banking days after receipt of the fund (US$4.6 million) in your country bank account as customary in legal services in my country. While you should arrange and only send now the government levy of (970 DOLLARS) to enable me commence and conclude actions on the authentication of the power of attorney/agreement in the Federal High Court. Send or call my office for the information as soon as you send the money to enable this chambers to go and get the money out from them and start the preparation of those document's as you requested which will only take two working day's for it readiness for the transfer. RECEIVERS NAME :COLINS JOHNSON SMITH. Compliment of the day Once again, how are you doing? I guess that you will be alright by the special grace of God and if so let thanks be to God though mine was very hot due to my present situation. Sweetheart, I am very happy to write you about how you can help me out please i want you to help me by sending me some money to buy foods to eat and I appreciate all you said and your caring heart to was my livening God bless you for the sake of my life and your concern over my today's living. please honey send it so that i can get it the same day to buy all this things I mentioned and to have a little one that i will be using to eat because I eat once per day and you know what it means eating once in a day, so please my love what ever that touches your heart I will appreciate if you could do this today or tomorrow for me let me cloth myself. Waiting to hear from you with love and trust from your heart. I am pleased to inform you about my success in getting those funds transferred under the cooperation of a new partner from London I am currently in the London for my studies here in the London mean while, I will not forget your past efforts and attempts to assist me in transferring funds that we raised this in some way. Now you need to contact the Rev-Father who used to be a good father to me when I was in Dakar, Senegal, his name is Rev Father Paul and his email address is as follows (revpaul44@yahoo.com) and his number is (+221772996261) i told him to send a certified bank check of $450.000.00 which i prepared and kept for your compensation for all efforts and attempts to assist me in this matter. I appreciate your efforts at that time very much. so feel free to contact the Rev Father and instruct him where to send you the money. Please let me know immediately you receive so we can share our joy after all the sufferings at that time. At this point, I'm very busy here because of my studies and I SORM project and the investor has to hand, finally, remember that I had forwarded instruction to the Rev Father on your behalf to receive that money. So do not hesitate to contact him and he will send the amount to you without any delay. And please do not forget to inform me as soon as you received the money. Take care and God bless you and goodbye for now.